Take your sense of style into every room of the home, starting with the bedroom - thanks to the Giverny Duvet Set, available in every size and in a timeless floral design. 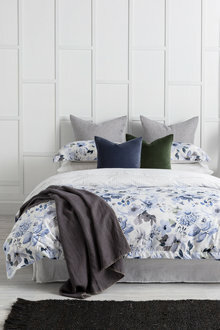 Soft in feel and in colour, the Giverny Duvet Cover Set will create a warm and welcoming home environment and offers a multitude of styling options. Elevate your bedroom even further by pairing this gorgeous set with dark tonal accessories.